Where have you been my whole life?! You taste utterly amazing! Why in the world carrot harvesters/producers/manufacturers take you off and give me only the orange part is beyond me and makes me very sad for you. Don’t worry carrot tops, you can now find refuge in my refrigerator, specifically next to the fail-proof homemade mayonnaise as carrot top pesto! One reason I love having a subscription to a community supported agriculture (CSA) box is that it forces us to try new things and new recipes. 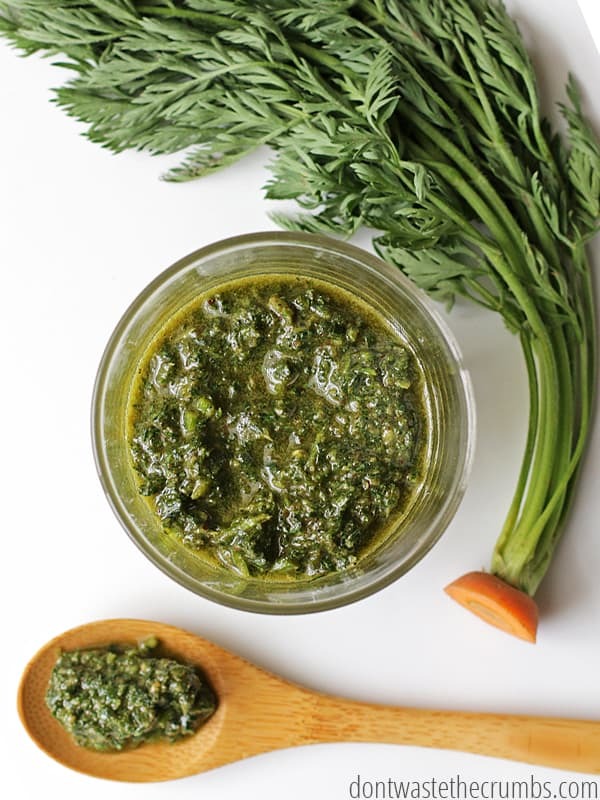 Like this carrot top pesto. But I’ve tried other new dishes too, like whole roasted carrots. 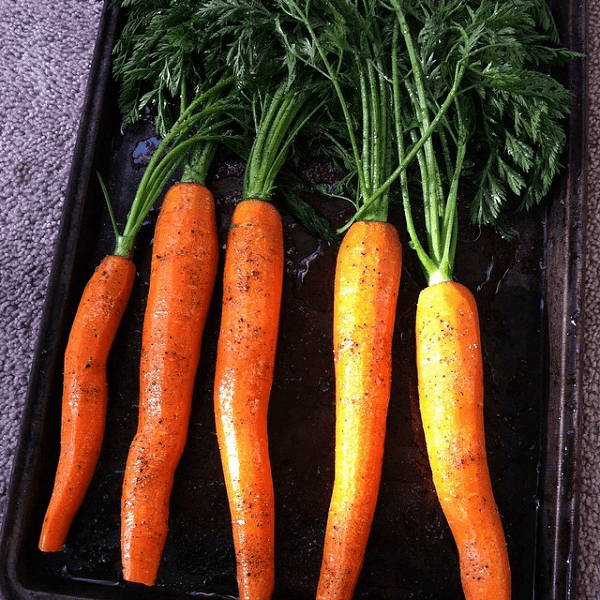 I washed the whole carrots – tops and all – and placed them on a seasoned cookie sheet. I liberally drizzled them with extra virgin olive oil, generously sprinkled them with salt and pepper and roasted them in the oven at 400F for about 30 minutes. The carrots came out awesome. Sweet, juicy and just tender to the bite. The carrot tops? Well, not so much. The high temperature caused them to be brittle and burned. They flaked off the stems, fell off forks and made a huge mess on the table. What little pieces of top that did make it into a mouth just tasted bad. 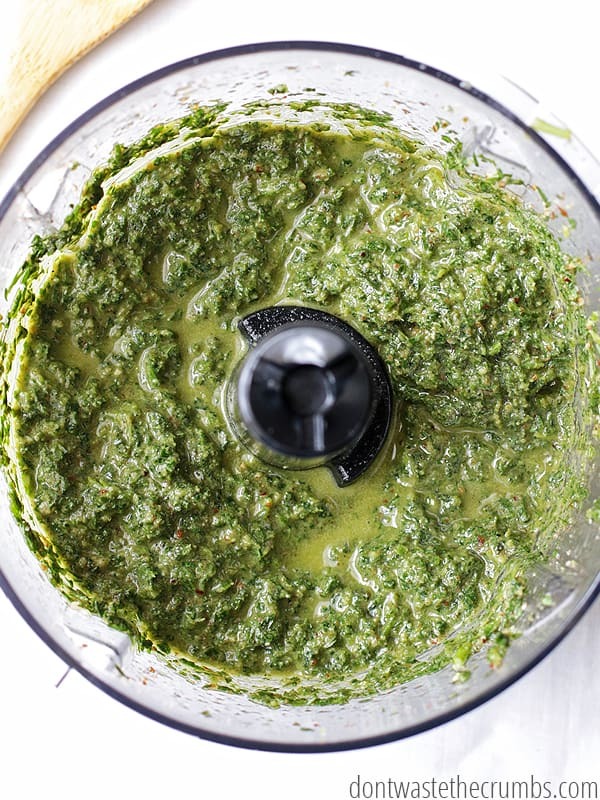 The next time we got whole carrots in the CSA box, I skipped the oven and tried another recipe that I’ve been wanting to try: carrot top pesto. Folks, we have a winner! This stuff is SO good and SO easy to make, I should have started making this eons ago! 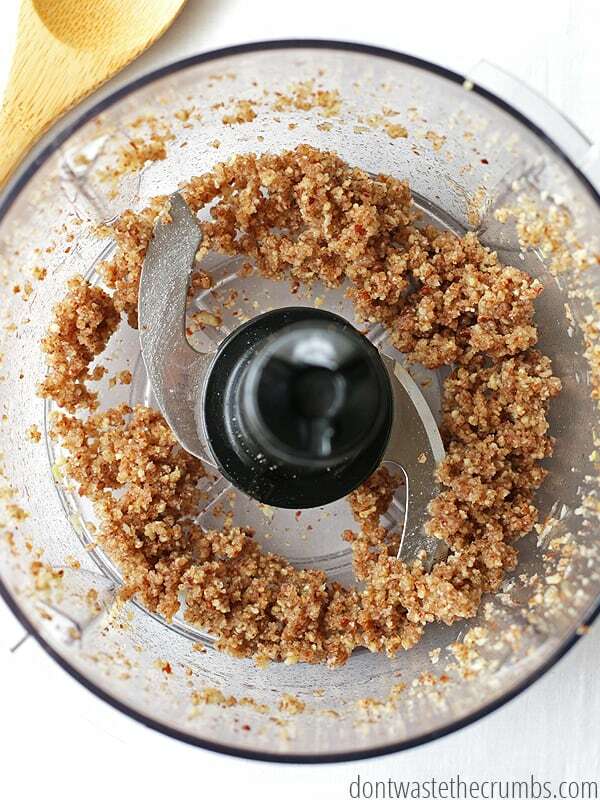 Measure nuts and garlic into a food processor. Pulse until a rough paste forms. How much of a paste you form will depend on the type of nut you use. (The natural oils from the nut will be released to form the paste). Add carrot tops and basil, and pulse until everything is in teeny tiny pieces and creates an even thicker, rougher paste. If your food processor is small (like mine), you might have to stop and move some of the herbs around a bit in order to get them to chop. Don’t worry if it’s not perfect though. You’ll be blending/processing again soon. Add 1/2 cup olive oil and pulse/blend until the mixture is mostly smooth. If the pesto is too thick, add additional olive oil if desired, 1 Tbsp at a time. I like mine to be spreadable, so I ended up adding another 1/4 cup for 3/4 cup total. Season with salt and pepper and you’re done! Makes about 1 cup. Store in a glass jar in the fridge. If you’re using quality olive oil, the pesto will likely solidify in the fridge. Bring to room temperature for 10 minutes before using. If your food processor is small (like mine), you might have to stop and move some of the herbs around a bit in order to get them to chop. Don't worry if it's not perfect though. You'll be blending/processing again soon. Add ½ cup olive oil and pulse/blend until the mixture is mostly smooth. If the pesto is too thick, add additional olive oil if desired, 1 Tbsp at a time. I like mine to be spreadable, so I ended up adding another ¼ cup for ¾ cup total. Makes about 1 cup. Store in a glass jar in the fridge. If you're using quality olive oil, the pesto will likely solidify in the fridge. Bring to room temperature for 10 minutes before using. Besides using food you would ordinarily throw away, the best part of this recipe is that it’s SO versatile. You can use any type of nuts and any type of herbs you want or happen to have at the time. Use less of items that have strong flavors, like peanuts or cilantro. Use more of items that have subtle flavors, like macadamia nuts or parsley. Taste as you go, and adjust. Always! Since I would only make this recipe if I already had carrot tops in the fridge, I don’t consider them in the cost of the recipe. And since we’re not using super-expensive pine nuts, we’re keeping the costs way low! 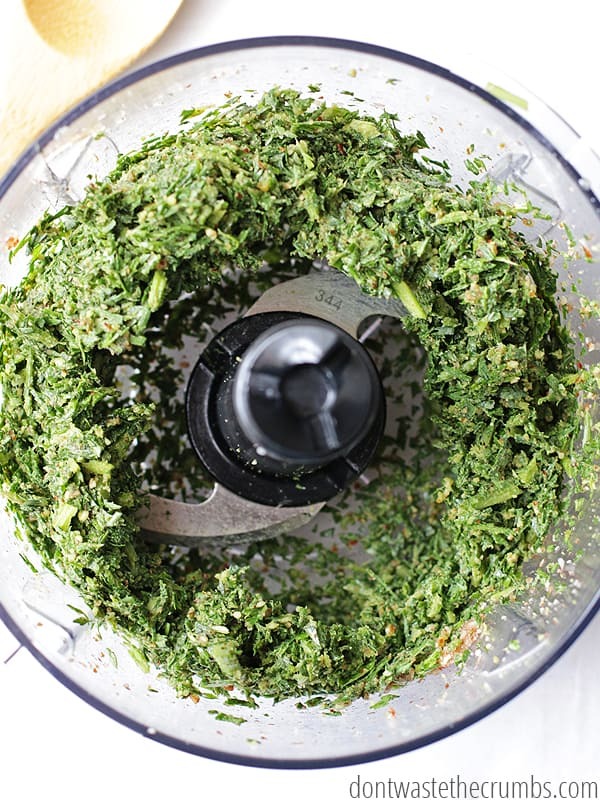 The total cost for 1 cup of homemade Carrot Top Pesto is $2.18. Compare that to the price of pesto from Costco (where I would normally buy it from) of $5.76 per cup. Making it yourself saves 62% AND prevents food from going into the trash can! Savings Tip: When you get to the itty bitty crumbs of nuts, save them for recipes just like this so you’re not “wasting” the money spent on whole nuts just to pulverize them. 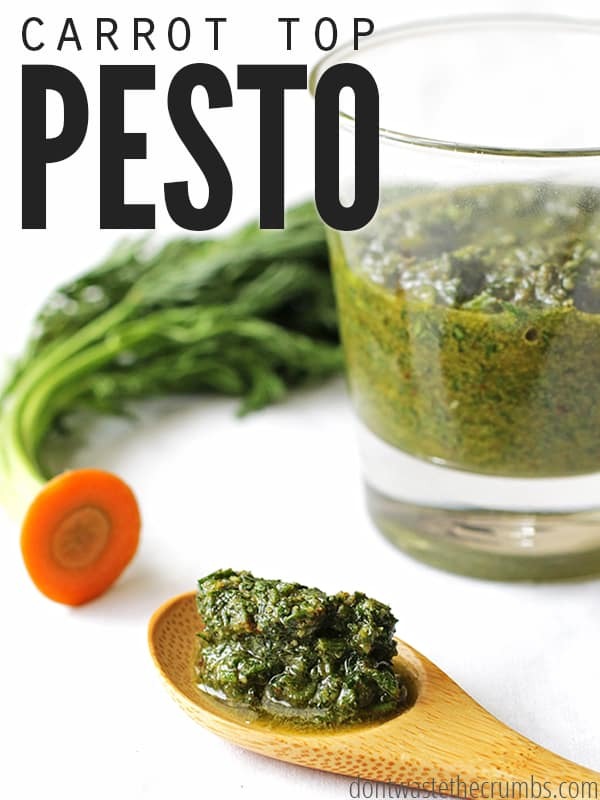 This pesto packs a HUGE flavor punch. Consider smearing it on bread for grilled sandwiches, adding some to homemade spaghetti sauce or mixing it with vodka sauce! Have you ever tried a carrot top before? What’s your favorite way to use them and not waste them? I have dried the tops and used them like dried parsley. You can eat carrot tops?! Thanks for sharing–sounds yummy 🙂 I’ve been composting them. No more! Genius! I wish I had known this last spring when I had tons of carrots in the garden! Traditional pesto is expensive, so I’m thrilled to not only have another use for next spring’s carrots but a frugal way to make pesto 🙂 Thanks, Tiffany! I’ve always wondered if they could be dried and used like dried parsley — but I almost never use parsley. So into my stock pot they go! Along with all the other scraps and scribbles of vegetable. My husband wants ‘that little green stuff’ in his chicken broth so I add finely chopped carrot tops to my homemade broth. I’m curious, do you think the pesto could be preserved to enjoy later? Frozen? Canned? How long will the pesto stay fresh in the refrigerator? It stays fresh in the fridge for a while so long as the herbs are completely covered in oil (it acts as a preservative). I don’t know if you can can it, but you could probably freeze it. This came out perfect! Printed, laminated and also shared! Thank you so much! Pesto of all kinds freezes really well. Don’t add parmesan cheese to it ( if the recipe calls for it) before freezing. I divide mine up into small quantities or fill an ice cube tray with it, freeze and place in freezer containers. It can be added frozen to soups and sauces or thawed and used as fresh adding in the parmesan after thawing. I find that it tastes just as fresh and delicious as fresh pesto. Glad you enjoyed it D’Shondra! I learned that carrot tops are edible from another shopper at the Farmer’s market. Looked up for a recipe but made a chutney instead . Slightly sautéed in oil chopped carrot tops , 2 chopped carrots, cilantro and 2 green chilies . Added salt and a bit lemon juice and blended till smooth . Very tasty with chapathis and rice . Family loved it . Thanks for the recipe. Will make the pesto next time .